Keeping your dryer vent clean is important for home safety. Get a free quote now for your next dryer vent cleaning from Chicago’s dryer vent cleaning experts. 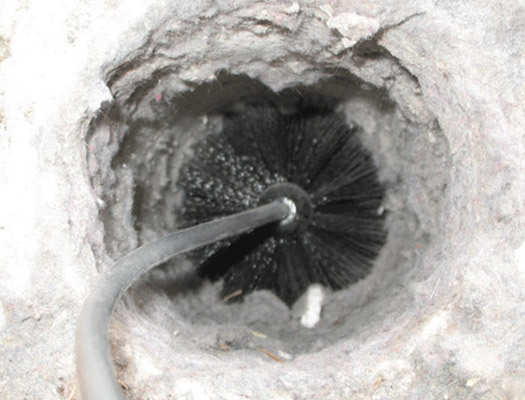 Dryer vent cleaning is a very important maintenance task that homeowners often overlook. Even if you regularly clean out the lint from your dryer’s lint trap, there’s more work to be done in order to stay safe and minimize energy consumption. Early Times offers quick and easy dryer vent cleaning to help keep your home safe and your dryer working as efficiently as possible. Depending on how many people live in your home or how often you do laundry, your dryer can undergo a lot of stress. It’s important to keep it maintained to avoid any problems down the road. Lint is an extremely flammable substance and can accumulate to dangerous levels in your dryer vent. In fact, the US Consumer Products Safety Commission stated that the dryer is the number one source of fires in homes. When lint builds up, it restricts air flow and causes excessive heat build-up which can lead to a fire igniting. If your dryer vent has gone a long time without being thoroughly cleaned, your dryer will not perform the way it should. You’ll notice that it takes longer to dry clothes and only the higher settings will work well. This directly causes a spike in your home’s energy bills. Getting your dryer vent cleaned eliminates the need to put heavy amounts of stress on your dryer. Plus, by not having to overwork your dryer, you’ll increase its lifespan. If you notice any of these signs, Early Times will take care of your dryer vent cleaning so you can live a safer life at home. Your dryer vent may not be the first home maintenance task on your mind, but you certainly shouldn’t forget about it. Many home fires are caused by a backed up dryer vent. Lint is highly flammable and only needs a little amount of heat build-up to ignite. If you haven’t gotten a dryer vent cleaning in a while and you notice that it takes longer than usual to dry your clothes, Early Times has the solution. Get a free quote today for your next dryer vent cleaning done by Chicagoland’s best – Early Times.